Last week I discussed the importance of sources and how I rank them from most valid in reconstructing to least. A thing to note, I find experimental archeology (swinging swords) the least valid in reconstruction, but it is still something you should do. My article on sparring discusses why, I just believe the horse (written sources) go before the cart (swinging swords). This week I will discuss how to take a source and interpret it. Source material varies in how clear it is. Let’s take apart a play from Fiore de Liberi. This image and text from the Flower of Battle is an example of a source that gives us a visual clue and textual as what is done. However, we are lacking in much. Fiore shows the starting position and ending, but not all the things in-between. His text gives more clues. Matching the picture is easy enough and someone teaching HEMA should look at a few things to make sure they are replicating what is depicted; The feet, the point of the sword, the overall body position, and the distance between the opponents are good starters. In this case the toes are forward with the rear heel raised, and the point of the sword is not pointed at the opponent. The body position has the left leg leading and the arms slightly extended. The distance shows that without moving the opponents can hit one another. Art shows a moment in time, so we need to be willing to give anyone recreating this position a little leeway. "I have placed a thrust into his face, as the previous Master said. Also, I could have done what he told you, that is, when my sword was crossed on the right I could have quickly switched sides to the left, striking his head or arms with a downward blow." The text from the prior image and the text from this one tells us what to do from the crossing of the tips. When crossed, we can cut to the other side, or thrust. Why is not explained. We however can find clues in a different source. This is a quote from Sigmund Ringeck who was a follower of the KDF (German) system of longsword descending from Liechtenauer. There is no direct relationship between Fiore and Ringeck, except they both describe the use of the longsword. How can a connection be made? Ringeck repeatedly discusses that a fencer has to know if his opponent is hard or soft in the bind and to act accordingly. This advice lends itself well to Fiore’s instructions. Using Fiore’s technique, we have two options when the sword is crossed at the tips. We cut to the other side, or we thrust. Applying Ringeck’s text, we know that at a bind at the sword will be hard or soft. This in itself should not be dependent on the system. What Ringeck does after is another matter and we’re not as interested in that. We can then drill with a partner and see how it all comes together. Sure enough, standing as Fiore shows with the swords crossed at the tips, we can feel that the opponent is either lax, or pressing into the bind, perhaps even pushing sideways to displace it. If hard, it is easy to jerk the sword back, let the opponent’s sword pass by, and cut the opponent on the head- all without moving. If soft, it is easy to extend into the thrust, gaining leverage with the motion. This too can be done while stationary. The actions fit with what Fiore tells us. Sparring can help us further understand this technique as well as possible variation. An example is, it is possible to advance the foot or even pass and get the same result. It is also possible in a hard bind not to life the sword, but to turn the edge in place and cut left to right into the opponent’s head, all while maintaining a bind. Are these interpretations correct? That is, and will always be, debatable. 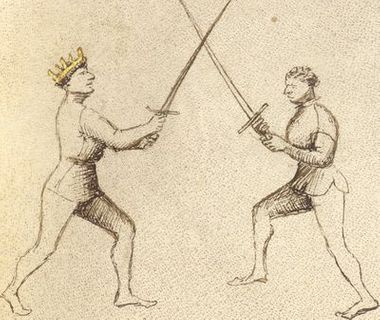 However, by using the primary source, a related source, drilling and sparring we have made a good argument that the play Fiore discusses comes from the meeting of the swords and is dependent on if the opponent is hard or soft at the bind. A weaker source leads to, inherently, a weaker interpretation. That’s ok! I love Polish Saber, but I will be first to tell you that with limited sources, we will have only a limited understanding of 17th century Polish saber fencing. However, that does not mean we should not try. 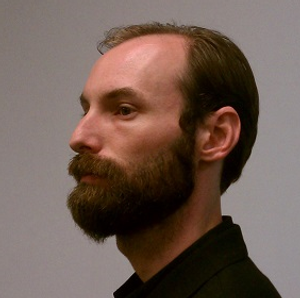 HEMA has plenty of arts lacking in sources, that doesn’t mean they have no sources. So long as we are honest with what we know, and don’t know, we’re on the right track. We have no primary treatise to work from. In my list of hierarchy, a primary treatise is the most valid material, but without it, we need to make do. We do have primary accounts. We have the writings of Jan Pasek, a 17th century Polish noble who engaged in numerous duels. Looking at three of his best described duels, the choice of target is telling. In all three Pasek wins the duel by striking his opponent in the pulses- or wrist. None of these opponents die. We have numerous diary accounts from the 17th century that Zablocki (from our time) compiled and compared. He noted that of the duels mentioned, a majority were ended with strikes to the hand, and the rest with strikes to the head. No deaths are mentioned. We have, Tomasz Sapieha, 17th century a Polish-Lithuanian Commonwealth noble who in 1632 he lost his hand in a duel with Jerzy Zenonowicz. Minus his hand, Sapieha went on to have a successful career. We have a secondary account from a Polish historian in the earliest days of the 18th century. 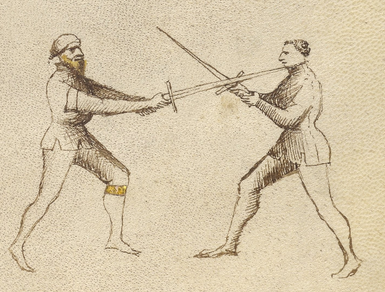 He describes how Poles used to duel and that the cheek, ear, fingers and hand would be struck in a duel, and that they were often not a fatal strike. He found saber wounds were far preferable to the use of warhammers which led to death. We have Starzewski’s 19th century instructions on Polish saber fencing. As a source he is somewhat suspect because of his distance from the 17th century, however he writes as if there was a direct relationship. He describes all the cuts, to the body and head, but also has a separate explanation as to all the targets of the hand. Despite lacking a direct treatise, it is clear from all the other sources that in a Polish saber duel of the 17th century, the hand was a popular target and that duels were rarely fatal. We also know the head was a target, and that it too was rarely fatal. This clue helps us further define Polish saber fencing. Techniques, (also derived from available sources) should be able to target the hand. What are those techniques? Again, a laundry list of sources are needed to try and cobble techniques together. The Polish sources, those of the 17th century and beyond mention cross-cutting, but no explanation is given as to what that is. By reading the first-hand accounts, other treatises which reference Polish saber fencing and looking at other treatises that mention cross-cutting, we can get a better idea of what that might look like. We will never be quite as confident with Polish saber as we are Fiore’s longsword. Fiore gives us a stronger source to work from. That’s ok! In HEMA we strive to re-create the lost martial arts, and we won’t always have all the tools available. Here, Charles and John are practicing a play with the rotella and sword from Agrippa. My role was to read the text, position them, and have them go through the motions. I then compared what they looked like to the image. We paused at times to all of us look at the text to make sure my rationale was correct. When creating your own interpretations you need to see how much source material you can get your hands on. Some systems are blessed. 17th century rapier, no matter which master you choose to study, is likely clearly instructed and comes with imagery. Atop that, there are buckets of contemporary sources ranging from the rapier hating George Silver, to the early masters such as Fabris, to later ones like Alfieri and after la Touche. Some systems are not so blessed and you will need to make do with what you have. Seek out not only the treatise, but others from the same time period. As we saw earlier, the writings in KDF (German longsword) can be applied to Fiore (Italian longsword)- even though there is not a one to one relationship (Germans longsword isn’t Italian). Other modern writers may have done interpretations for you. 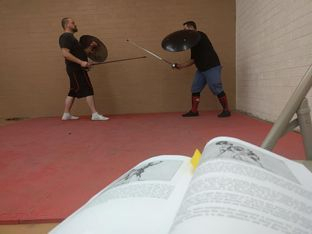 This is a great start and when I first entered the world of HEMA I used the interpretations of Guy Windsor and Christian Tobler before developing my own. I now write my own interpretations and I imagine I’ll be the guide to someone’s HEMA journey before they put me aside and develop their own ideas. This is also where going to seminars can help. I run quite a few and have been to quite a few. From these, ideas are exchanged and we grow. With friends it is easier to puzzle out plays, one at a time. I find it helps to do this first, then try to fill in the gaps later. With a source you may find there is a common theme in the techniques depicted- which in turn helps you understand future techniques from that source. Be sure to understand context. This may change how you view a technique. Example, in Fiore’s use of the spear, the use of the pass is often used on the attack and defense. Why? Why not just lunge all the time for extra reach? Why not perform a one handed lunge? Looking at other parts of Fiore’s work, there is a hint in the dagger section. Looking at context of the art there are more clues. Fiore does not spell out the answer, but a very plausible and defendable one is there. I’ll let interested parties ponder this! The point being, the context of the source can in of itself provide clues to how it works. This is the serious work behind HEMA and is enjoyable. Do not be worried if you come up with an interpretation, spar with it, don’t like it, and wonder if you did it wrong. Do not be worried if you come up with an interpretation then years later ditch it, then years later, pick it back up. Do not be worried if people think you are wrong. You might be! Consider what they have to say. We are always trying to interpret the past and in the case of HEMA it will never be an exact science. This process to understand more, to make our sparring better, to find more sources and interpret them is HEMA and will be ongoing. Enjoy it. Like what I have to offer? Be sure to share the article and consider the others on this page! HEMA is a small community and so only through readers LIKE YOU can I promote my material, sell the odd book or two, and write yet more material. If you like the content here, be a SUPPORTER and buy a book, share an article, and keep track of what new material I have available. Thanks to everyone who has shown an interest before! It is very much appreciated.